It's been some time since part three of 'a trip with the Beatles', for which I apologise, and no, I have not yet edited the 'Get Back sessions' to share, I feel another apology coming on. So this is part four, and I make no apologies for this! A twenty three track album, the copy I have obtained goes under the name of 'Magical Mystery Tour Outtakes', it is however far more than that. Lets go interactive for a moment. If you have the time, read the Wikipedia entry for the Magical Mystery Tour (click HERE). It's easy to forget the 'TV' film version bombed originally outside the UK. and was panned by the critics of that time. It's a reflection on my personality I guess, that I loved it, it is however the music that in typical Beatles style has demonstrated longevity. I think it reasonable to say that against the Wikipedia background, this series of recordings are an absolute must for all Beatles fans, and curious parties. This is one of those moments in time. When a band introduces a 'new song', as they did during this performance, one that all these years later we know to be, a 'classic' of theirs, you can begin to plot that occasion with greater clarity. Manfred Mann's Earth Band have never been superstars. I think it fair to say that was never the intended goal, indeed the choice was taken to move away from 'three minute pop songs' and chart hits, and explore more creative ideas. By the time of the 'Roaring Silence Tour' they were however well established, but they did not fit that comfortably into any particular rock niche. A bit Prog, a bit rock blues, sometimes just Manfred Mann, growing a little older. This is a recording of them at the Spectrum, Philadelphia USA, on the 15th October 1976. They were, and indeed remain a recording band, one of those acts who seem to embrace a lot of contemporary artists, and not detract from the original idea. The Red Hot Chilli Peppers playing FliegendeBauten, Hamburg, Germany on the 24th April 2006. I am not a massive fan of the band, however I sense on this occasion as far as popular opinion goes, I may be swimming against the tide, with lead weights attached to my arms and legs. That said having listened to this concert, I would not turn down a ticket or two, to see them live. The sound quality is excellent (pre FM - stereo soundboard), almost too good at the start when they seem to be a little slow getting going (or is that just my ignorance). I reckon a lot of people are going to enjoy this. (click on the links to download). Time to up the energy levels! This is Billy Idol recorded live at the Poplar Creek Theatre, Hoffman Estates, Illinois, USA, on June 1st 1984. Poplar Creek was an outdoor concert venue located in Hoffman Estates, Illinois. The property consisted of 200 acres at the intersection of Higgins Road and Route 59. When it opened in June 1980, the surrounding neighborhoods weren't exactly thrilled. To appease them, the inaugural concert featured a very non-threatening John Denver. This is Billy Idol recorded for a syndicated radio series at that time, so apologies for the appalling and 'quite cheesy' intro and the end 'really hip' DJ comments. That said the actual concert is pretty nifty to say the least, and the sound quality is high standard FM stereo. Reloaded 23/02/2016 link in comments. Just another one of those posts, to remind you another decade of your life has slipped by unnoticed. 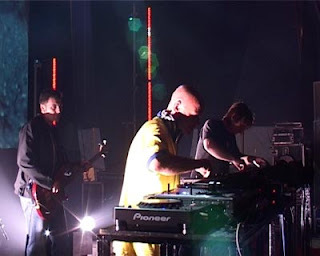 This is The ORB live at The Barrowlands, Glasgow, Scotland on the 20th March 1997. There is some new material available this summer, and they are touring, your chance possibly to see the masters of ambient music! For more details of releases & tour details clickHERE. Also some remastered ORB options HERE. REPLACEMENT LINK IN COMMENTS OR CLICK ON THE PICTURE (17TH SEPTEMBER 2009).